ANITA GAIL JONES is a visual artist, storyteller and writer born and raised in Albany, Georgia. Her Fine Arts degree is from Guilford College in Greensboro, NC. 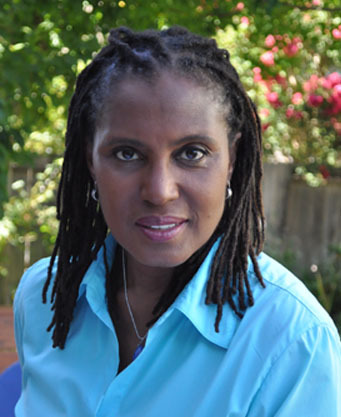 Her passion for writing and Illustrating children’s stories lead Anita to oral tradition storytelling and working in Bay Area schools as an artist-in-residence, in addition to tailoring storytelling programs for libraries, corporations and private clients. Publications include ~ Gardening Among Friends, Practical Essays by Master Gardeners, Edited by Barbara J. Euser; gardening articles for The Marin Independent Journal, and articles for The Women’s Eye online magazine. Anita’s short story, Hand-Me-Down Blues, won an award from The Pinch literary journal. Her debut novel, Peach Seed Monkey is now in the query phase. An earlier version of the story was named a Novella semi-finalist in the 2007 William Faulkner-William Wisdom Creative Writing Competition. An alumna of the well-known Hedgebrook women’s writers community, Anita is currently an Affiliate Artist at The Headlands Center for the Arts. Anita’s family—husband and millennial daughter—lives in the San Francisco Bay Area . Hey Genia! So glad you found the blog…especially since it was YOUR daddy, Paul who gave my sister Betty and me the REAL peach seed monkeys back in the 60s! We will definitely keep in touch. Great to run into you at the Headlands. Look forward to keeping up with your story.